In a continuing effort to offer affordable lecture capture to every classroom, Matrox has announced enhanced integration of the Monarch LCS with the Kaltura Lecture Capture system and broader Kaltura Video Platform, one of education’s fastest growing video management solutions. 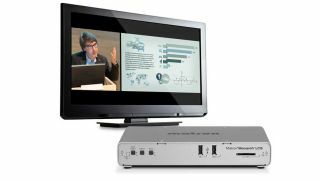 Immediately available as part of a Monarch LCS firmware update, the integration is designed to give college and university IT managers greater freedom to integrate budget-friendly, stress-free lecture recording in even more classrooms. From the Monarch LCS Command Centre, users can now directly add their Monarch devices to their network of Kaltura managed classrooms. Immediately, the Monarch device is available for scheduling and management from the Kaltura Lecture Capture interface, tying together scheduling and publication of materials to the relevant viewers. The Kaltura platform also provides a dedicated multi-stream player for playing two synchronized video files, such as those captured by the Monarch LCS. This unique feature of the Monarch LCS appliance and the Kaltura video player enables viewers to switch seamlessly between their preferred layout during playback while maintaining perfectly synced audio and video, putting control in their hands. Matrox Monarch LCS is available through a worldwide network of authorized dealers. The latest Monarch LCS firmware with Kaltura integration is now available to registered users as a free download from the Matrox website.